Myself JAIVIGNESH.P from nandha engineerinng college at erode.Studying B.tech in the stream of information technology final year student.Searching for library management system .your project is nice. please send me project and source code. its very usefull for me academics. Hello sir , i already liked your page on facebook but it still locked! whats the matter? can you send it on mail please? could you send to me this project please. I am not able to login with newly created id/passowrd . how to run this ? 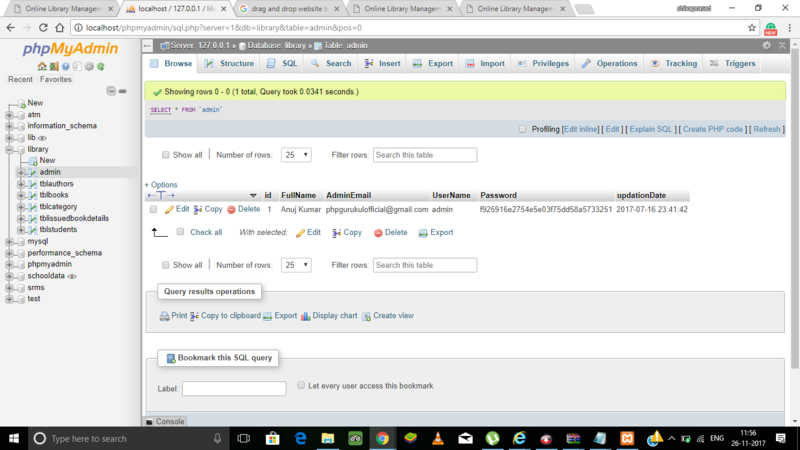 i m getting problem in admin panel, when issuing new book to a student,. whenever i click the issue button, it always shows an error of “somthing went wrong, please try again later” . its else part is working bt “if ” conditon is not working. have you change the code. Then check your db because code is working fine. Sir have u used any frame work in this project ? or its pure based on core php and oops? hi, I already like your page on FB but the download still locked. Please help me! Thank you! Sir, i liked your FB page but cannot download the project. Hello sir,thank you for the code. Its working but i cannot login to admin page. Thank you sir!! It works!! and in admin dashboard author list is not updating, update date column is showing NULL..
how to resolve it sir?? ?